Of all the qualities required to become a successful martial artist, if one were to be placed above all others, what would this most essential ingredient be? Would it be size or shape? Does age come into it? The hours one puts in each week? Is it the number of goals they set? Or is it the effort they put into their training? I do not believe it could be physical capability because too often we see two students, both almost identical in age, ability and training ethic, and yet while one progresses quickly, the other constantly stagnate or worse, drops out completely. believe the single most important ingredient for your karate success is attitude, because with the right attitude, all other important ingredients are achievable. Attitude is a bit of a buzzword these days. We hear it mentioned everywhere, at school, at work, and in the sport. We hear things like, ‘he’s got a bad-attitude’ or ‘she has a positive attitude’ or ‘that person has a negative attitude’, and so on. Attitude is the way we respond to life. Our attitude determines the way we view those circumstances that come our way and how we handle our feelings. Regardless of what happens to us, good or bad, we always have a choice of how we react. Things happen to all of us. We all get sick; we all get injured; we all get distracted by work, school, and family from time to time. We all go through those periods where we are not progressing, or where we are not as motivated about training. It happens to us all, or should I say that life happens to us all, for that is simply life. Despite all this, in the end, it’s not what happens to us that counts; it is what we do about what happens! Many negative people often accuse positive people as living in a ‘fantasy world’. Their argument is that being positive doesn’t mean bad things won’t happen to you – and they are absolutely right. However being positive has nothing to do with what will happen, it is purely about how you choose to respond to what happens. The positive thinker understands that the world may throw them some unfavorable circumstances but equally, they know that they will be able to see it through and come out the other side better for it. So, just as it does in life, our attitude in our karate training will determine where we end up. As stated above, our attitude determines our response to situations, be it positive or negative. We make excuses why things are the way they are. We close our mind to all the possibilities. We put in less effort, which in turn leads to poor results. We find a loss in the desire to train. Our willpower or the power of persistence weakens and often, our self-esteem is damaged. All of this finds us stagnating in our current circumstance, and we start to experience frustration, anger and a downward spiral of emotions. Things do not seem to be getting better ‘for us’ and we persist with a pessimistic attitude, or drop out. A quote to remember is, ‘Don’t get bitter, get better’. A positive attitude does not always bring about positive outcomes but it does raise the odds significantly. Obviously, in contrast, a person who chooses – note the word is ‘chooses’, not ‘has’ – a positive attitude is that they are going to become solution oriented, and symptomatic of this is the following. We do not allow ourselves to make excuses. We accept that unfavorable circumstances happen and look for ways to improve ourselves. We understand that by improving ourselves we can improve our circumstances. This opens our mind to many possibilities, which in turn, further strengthens our optimistic outlook on the future. Our optimistic outlook inspires extra effort, which in turn leads to a gathering of momentum. Having new solutions, new goals, and new optimism, we find our desire to train increases as we become eager to turn things around. All this culminates into a greater sense of persistence and self-esteem, and eventually, we come out the other side stronger not only better in ability, but stronger in character. By opting to react positively to unfavorable circumstances (such as injury, prolonged sickness, stagnation, a failed grading, loss at a tournament etc), we feel better about ourselves and are moving closer to our goals. Our attitude determines the way we train. With a positive attitude, we are continually looking to improve and develop our skills. It determines how much effort we’re willing to put in to achieve our goals. It takes our training to a new level and it pushes us beyond our comfort zone. 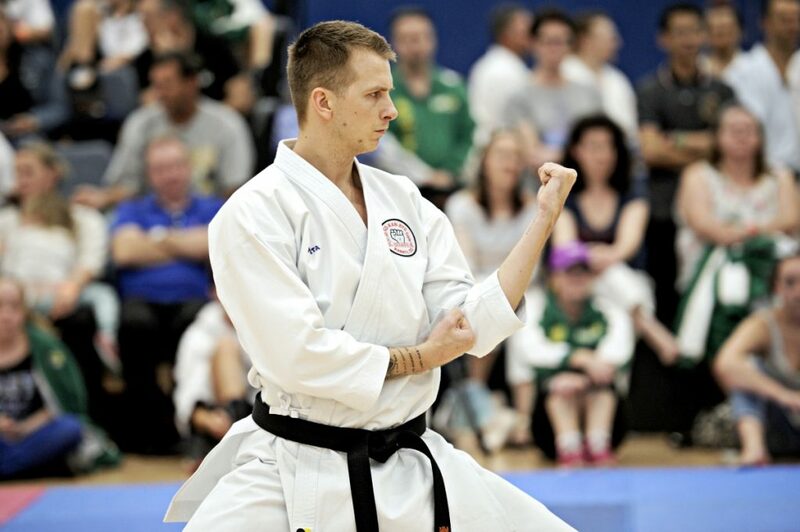 When obstacles do arise – like injuries, cold nights, flat spots – it keeps us focused on the bigger picture, our karate goals and this keeps us going. A good attitude in karate also serves a further purpose; it provides for us the quality of humility. It lets us know there is so much more to learn, and that everything we currently know is a work in progress. It also keeps our ego in check. So how do you respond to unfavorable circumstances that life throws your way from time to time? And how would you describe your attitude towards training? Perhaps your answer is not as positive as you would like! But that is fine because while our current attitudinal habits may not be constructive, we all live with the power of choice. Our habitual response may be negative, but by being aware of the power of attitude, we can question our response and choose to follow a better one. Over time, this new improved attitude will become a newly improved habit. Direct Debit Training Fees Now Available!